Application to edit/translate multi-language .NET string resources in parallel. Softerra LDAP Browser is a lightweight version of Softerra LDAP Administrator. Excellent software application solutions from the greatest in download websites! Investigate the asked-for utilities groups, watch the latest versions of the perfect programs utilities, and acquire at once! Do not toss away opportunity to acquire the hottest package: utilise SoftEmpire directory to download software programs for free. Meet the collection of shareware and software test versions. Select among Windows and Linux utilities programs, try manipulators, playgames, and all other forms of programms for your laptop or cell accessory! 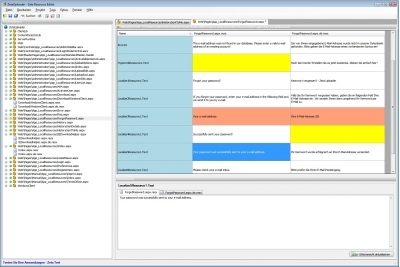 Zeta Resource Editor is a free application that enables you to edit and translate standard Microsoft .NET string resources from multiple different resource files and multiple languages together inside one single data grid.